In 1916, Arthur Shaughnessy is a vice president and general manager of New England & Pacific Railroad Company, which was won by his father, “Colonel” Shaughnessy, in a card game. The railroad is in financial trouble due to the Colonel’s profligate ways. The Colonel appreciates the finer things: yachts, summer houses, his cattle ranch in the northern Mexico state of Chihuahua. Meanwhile, back at the ranch, Pancho Villa is poaching cattle to feed his Great Northern Army in furtherance of the Mexican Revolution of 1916. The Colonel decides to drive his cattle herd from the ranch in Mexico to El Paso, both to save the valuable herd from Villa and to sell the cattle at auction to meet the railroad’s payroll. Disaster ensues when the Colonel takes the whole family along and his grandchildren are kidnapped for ransom by an equally cash-strapped Villa. Borrowing from Dickens and Little Orphan Annie, Groom plucks Arthur from an orphanage in Boston, sending him to live with the Colonel and his wife. Arthur’s new life is privileged and he is loved and supported by his new family, even if the Colonel never quite thinks Arthur manly enough for the Teddy Roosevelt stereotype he most admires. This generational struggle is the cause of questionable decisions when Arthur and the Colonel set out into the Sierra Madre to rescue the children from Villa. 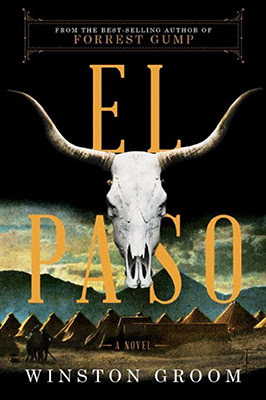 El Paso: A Novel is the first work of fiction from Winston Groom in almost twenty years. Groom is the author of Forrest Gump, and so El Paso has been eagerly awaited. Like Forrest Gump, the stories of the fictional characters of El Paso unfold against the backdrop of history, interacting with historical characters. Unlike Forrest Gump, the technique is not as successful in El Paso. As in Forrest Gump, El Paso is filled with dark themes: war, revolution, psychological and physical abuse. The two novels also share a sense of humor. It is this humor that falls flat in El Paso. The character of Gump, many times unintentionally funny, is so good-hearted and sincere that the humor is front and center without being forced. No such character exists in El Paso, leaving the humor to the third-person narrator, which results in cognitive dissonance against the dark backdrop. Groom claims El Paso is not a historical novel, but it fits the definition of such. It is a skillful weaving of history, historical personalities (Tom Mix, Ambrose Bierce, and Mabel Dodge among them), folk tales, and fictional characters into a single narrative. Unfortunately, El Paso meanders, Groom taking off on twisting rabbit trails which fail to further the plot or shed light on the characters. While certain of these trails prove entertaining, El Paso is a hundred pages too long and suffers from an identity crisis, testing the patience of this enthusiastic reader. Oligarchs and Marxists converging on El Paso is a promising construct, but El Paso is self-indulgent and doesn’t know whether it’s a farce or merely comedy.